The Ellen DeGeneres show is a total gem. I laugh and smile at every episode, primarily because host Ellen DeGeneres never lets the material get stale, and she never gets too caught up in routine: Each episode is so different than the one before it. She also keeps the surprises for celebs coming, which is without a doubt one of the best parts of the show. I mean, remember that time Kristen Bell started bawling mid-interview literally just because of sloths? It's impossible to watch that clip and not think The Ellen DeGeneres Show is one of the best talk shows in years. Many celebrities are very conditioned to maintain a perfect demeanor during talk show appearances, which can often lead to a very boring, humdrum experience for all involved, especially the viewer. On this series, however, this is seldom the case — and that's primarily thanks to Ellen thinking outside of the box when it comes to interviewing her celeb guests, and surprising them. She has created music videos spoofs, thrown impromptu bachelorette parties, learned dance routines, introduced stars to their own celebrity crushes, and donated to charitable causes, all in the name of keeping her show fresh and fun. The release of Nicki Minaj's music video for her song "Anaconda" nearly broke the Internet. Everyone and their grandparents watched it and analyzed everything from the "plot" to the wigs to the booty to that random Drake lap dance scene. The talk show surprised Minaj with a version of the video that included Ellen shaking her booty alongside the rapper. Minaj couldn't contain herself in response to the hilarity. While Sofia Vergara was talking about her engagement to former fiancé Nick Loeb, Ellen brought out a man to serve up some coffee. Then, she gifted Vergara with a bachelorette sash — and it wasn't long before some music started playing and the barista took his shirt off to start giving the actress a lap dance. Vergara was pretty shocked, which made the whole prank even better. Ellen seems to be all about these wild bachelorette party scenarios: During Miley Cyrus' 2012 appearance on Ellen, the two ladies were talking about Cyrus's wedding plans when a light suddenly burned out. Ellen had two "maintenance men" on standby to fix the problem and, as expected, the men turned out to be beefy strippers who were ready to give Cyrus a lap dance. Hilarity ensued. If I ever get engaged, I want Ellen to plan the pre-wedding festivities, because this really seems to be a specialty of hers. Instead of giving Keira Knightly a raunchy, stripper-filled bachelorette party like she has for other guests, Ellen opted for a nice bridal tea party for her British guest. The two wore elaborate wigs with sophisticated hats on top while they sipped on some tea. Before Taylor Swift was running the world, she was like your average teenage girl. Swift even had a crush on Justin Timberlake. Ellen found out about this is in 2008, and, of course, promptly brought Timberlake on the show when Swift was a guest. The "Blank Space" singer was visibly flustered when Timberlake sat next to her, and it was just the cutest thing. I'm sure everyone has seen this Kristen Bell sloth video by now. I still remember the shock I had when Ellen first debuted it, much to Bell's surprise. It's a very raw video of an emotional Bell reacting to her husband telling her she would get to hang out with a sloth as a birthday gift. After viewing, I will automatically think of Kristen Bell every time I hear the word "sloth." Britney Spears is just the cutest pop star on the planet Case-in-point: After telling Ellen that she loves the song "Gangnam Style" by Psy, Ellen brought him out and surprised Spears with an impromptu dance lesson. When Bengals player Devon Still appeared on The Ellen DeGeneres Show, he discussed his four-year-old daughter Leah's cancer treatments. During the interview, Ellen was wearing Still's jersey and revealed three major surprises: First, she said that she was going to sign the jersey and have the upcoming guests on her show sign it before auctioning it off to benefit a children's cancer charity. Then, she revealed that she will be sending a special gift package to Leah Still. Finally she announced a $10,000 donation to the Children's Hospital of Philadelphia where Still's daughter receives treatment. Still was beaming in response and touched by Ellen's generosity — the word "generous" is in her name for a reason (well, OK, kinda). What a touching surprise! The Olsen twins rarely make television appearances, but when they do, it's on Ellen. In a September 2010 appearance, Ellen discussed the twins' signature look: big sunglasses and big purses. As a joke, Ellen gifted the twins with giant sunglasses and giant purses— as in sunglasses that are bigger than their faces and handbags they could probably climb into. The gesture was hilarious. 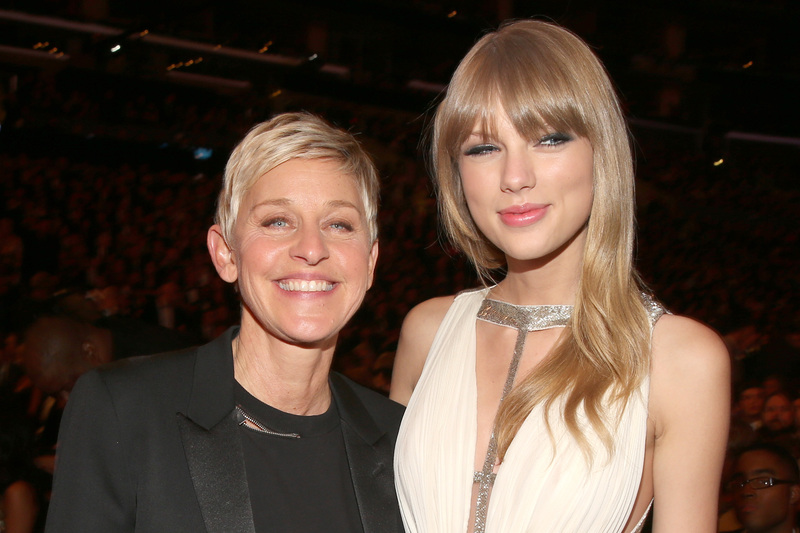 Ellen loves to surprise celebrities, but celebrities also love to surprise Ellen. For the talk show host's birthday, Justin Bieber came out of hiding with a video full of birthday wishes for "Ellen's 21st birthday" until he revealed that he was actually in the building. Ellen was so excited that she tweeted, “I can’t believe the surprise I got for my birthday show. Then I saw his face. Now I’m a Belieber.” Let's hope this surprise ushers in a new era of Justin Bieber.